In the blue flower silicon cup is from a leftover SunButter & jelly sandwich on gluten free, peanut free bread. Instead of wasting it, I cut it up into small bites. Around it are red seedless grapes. 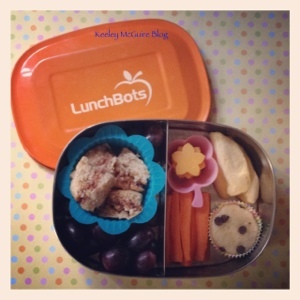 On the other side of this LunchBots Duo container is a small silicon clover cups of flower cut cheese bites. Beside it are freeze dried mangos. There are also carrot sticks and a mini banana chocolate chip gluten-free muffin.